Link’s new ability in the upcoming 3DS Link to the Past-inspired Zelda game is rather cool from a gameplay standpoint…and more importantly, is ripe for parodying. Who knew walking on walls would be so dangerous? 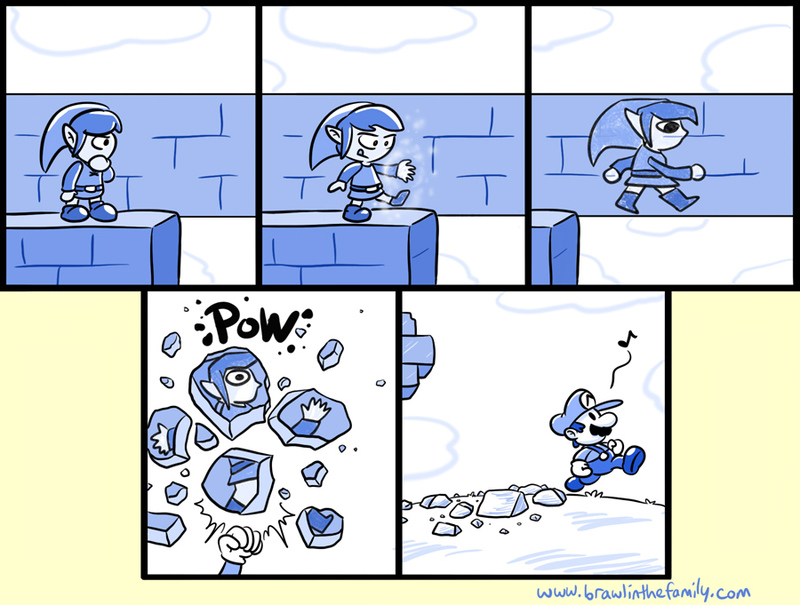 Hopefully Eario can humpty dumpty that mess so Hyrule isn’t forever doomed. Some of you have gotten your books already! If there’s a problem, please send me a message via Kickstarter (or email if you don’t have a Kickstarter, but the former is preferred so I can keep them in one place) and I’ll do my best to fix it. Between getting the international orders labeled and paid for, and the continuing progress on digital rewards, I’ve still been quite busy over the past few weeks. Thanks for your continuing patience!